I wanted to send out a congratulations to the Auburn Tigers on a hard fought win that will live on the epic story of the Iron Bowl. I admit I broke my remote control as I slammed it on the floor following the last second field goal return back by Auburn. 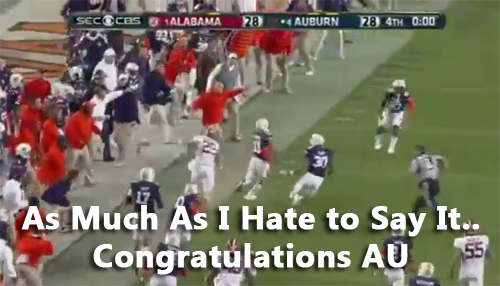 I also said I hate Auburn! After I cooled down, I realized that talk is cheap and all that matters is how you play on the field. Alabama simply did not play up the standard of Nick Saban football. In fact, even Nick Saban himself did not live up that standard with some of the poor coaching decisions he made, most notably the last one. Bear Bryant once said, "Losing doesn’t make me want to quit. It makes me want to fight that much harder." Even though Alabama lost a game that it shouldn't (count the field goals missed), we do need to be classy and give Auburn their credit. They played a heck of a game and the score showed it. As bad as I feel, maybe it will make Alabama hungry enough to start another 3 national title run. Alabama... just get back to work. Congratulations Gus Malzahn & Auburn on a game well played. Auburn grad here…..thank you for your class! Respectful and very much appreciated.